Forty years ago this week, the U.S. Marines at Camp Pendleton began welcoming allies, a lot of them. 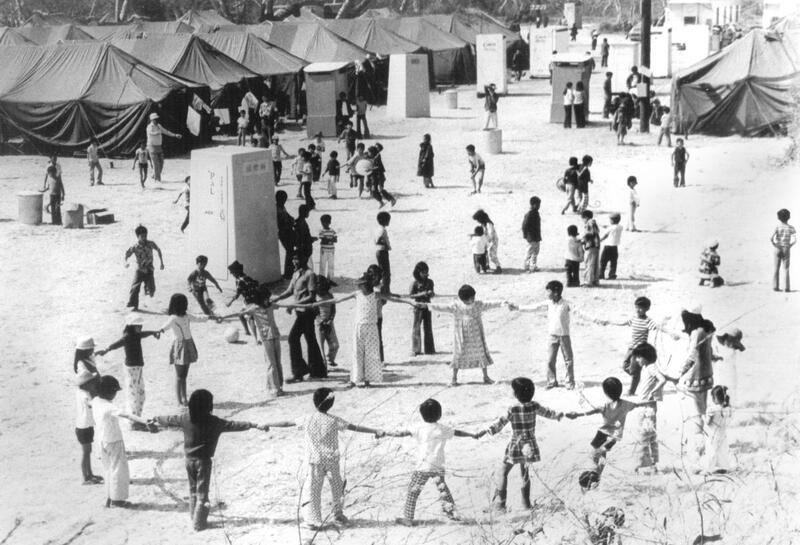 With three days to prepare, more than 1,000 Marines, sailors and civilians worked around the clock to set up a tent village for a wave of hungry and exhausted refugees from South Vietnam, the first 851 of whom arrived April 29, 1975. 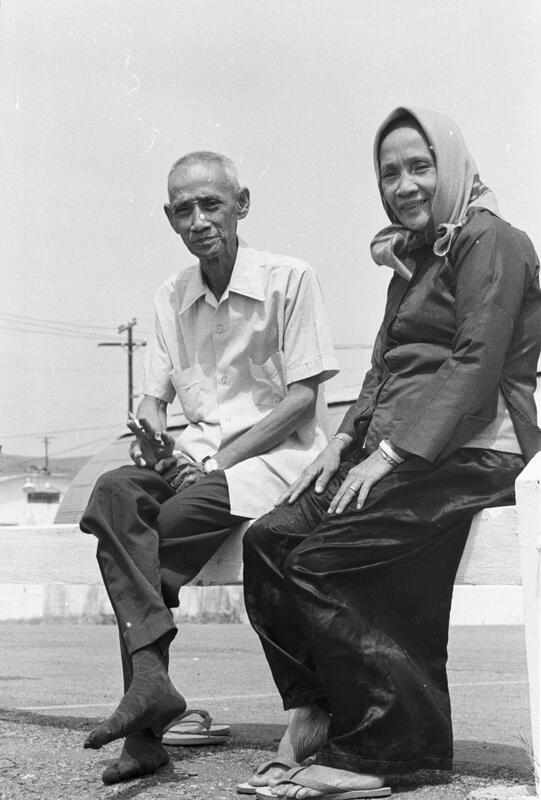 The following day, Saigon, the capital of South Vietnam, fell to communist forces from the north. 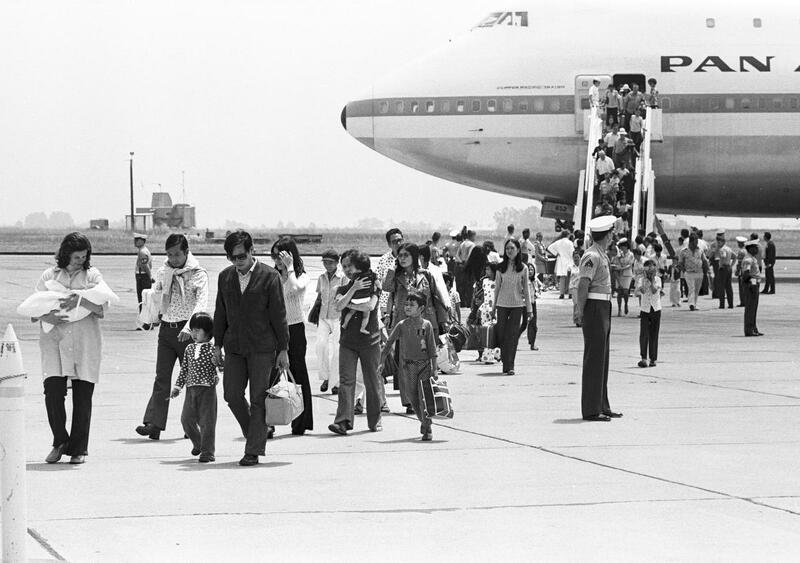 The war ended, and the exodus of Vietnamese refugees swelled. Getting it done – setting up the nine tent cities and preparing for an eventual 50,000 refugees to come through – was a massive undertaking. The Marines installed sewage and communications lines. They pitched tents and refurbished Quonset huts. They came up with a plan for educating the refugees on American culture. There were challenges for the refugees as well. In time, the meal plan was made more culturally sensitive. But there were still the cold nights, a lack of proper clothing and language barriers – and the lingering emotional trauma of war and separation of loved ones. But, slowly, things got better. They built a community. 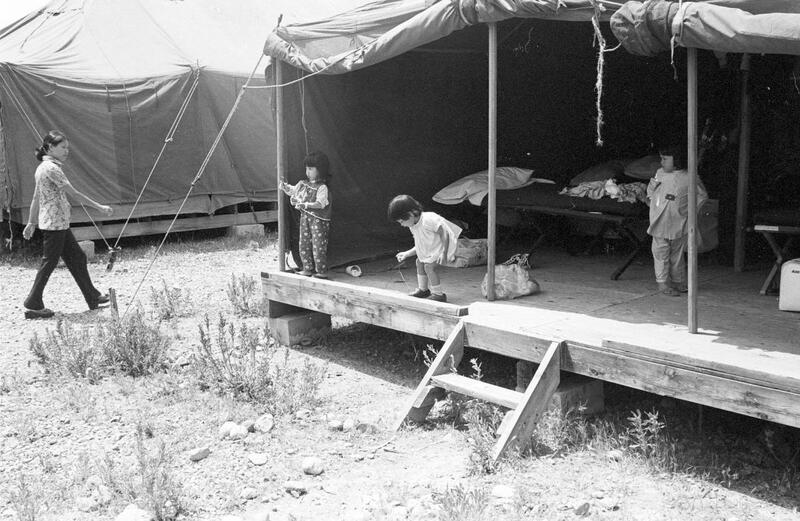 By October, the tent cities were gone, but the refugees’ American lives were just beginning. They started chatting with each other, Faye Jonason, Pendletonís chief historian said, and the kids played with each other. 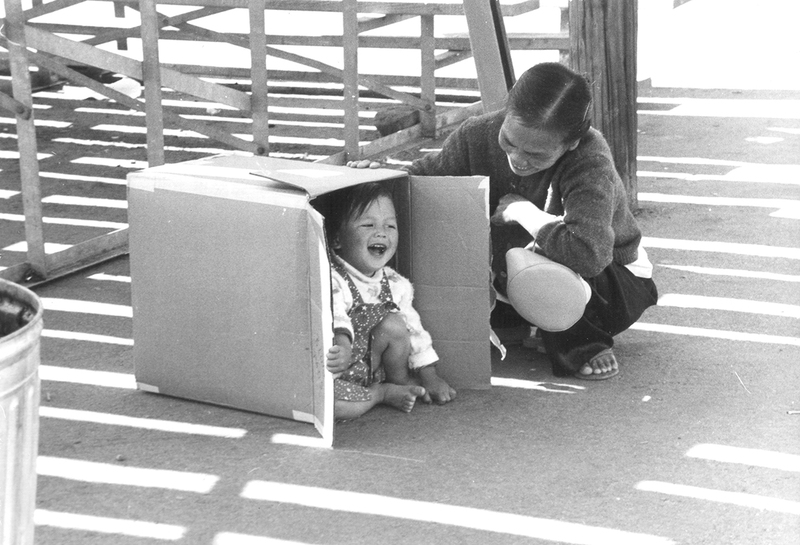 A Vietnamese baby girl and her grandmother play a game of “peek-a-boo” in Camp Talega, aboard Camp Pendleton, California. 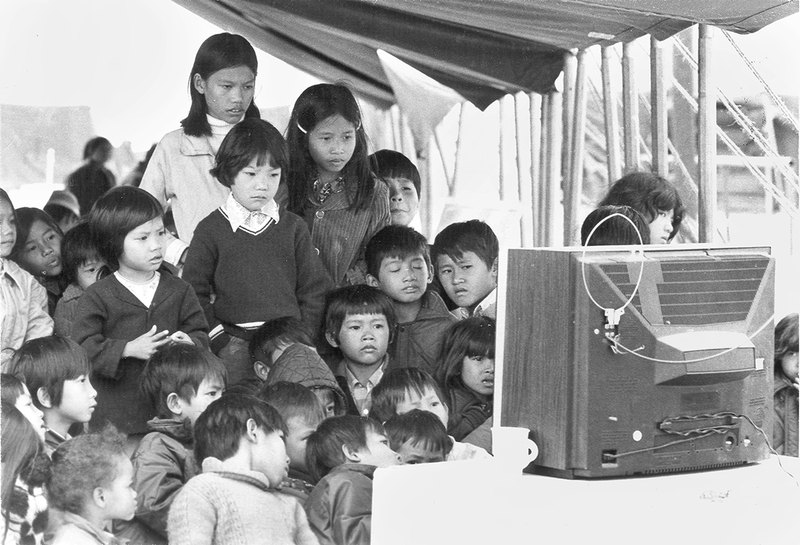 Vietnamese Refugee children at Camp #6 aboard Camp Pendleton, California, gather around to watch Sunday morning cartoons on television. There is no language barrier for these children, as these children understand the American pastime of watching cartoon shows. 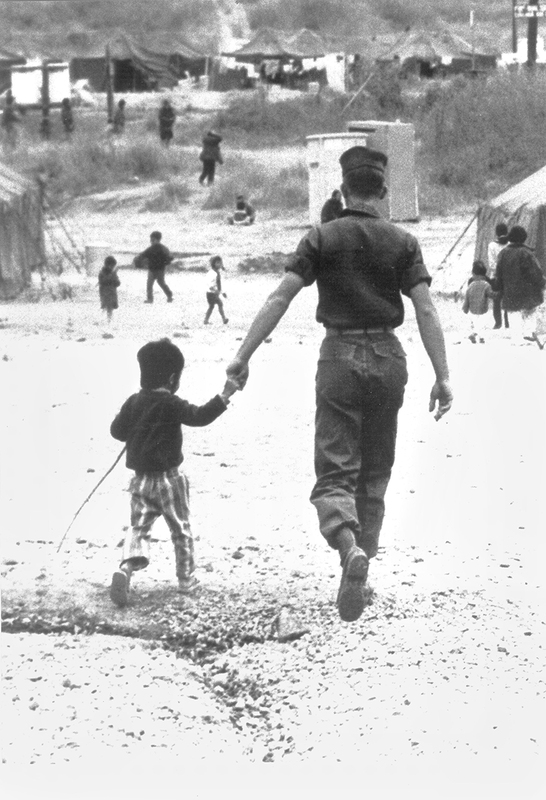 A U.S. Marine takes time to walk along with a young Vietnamese boy at Refugee Camp #5. 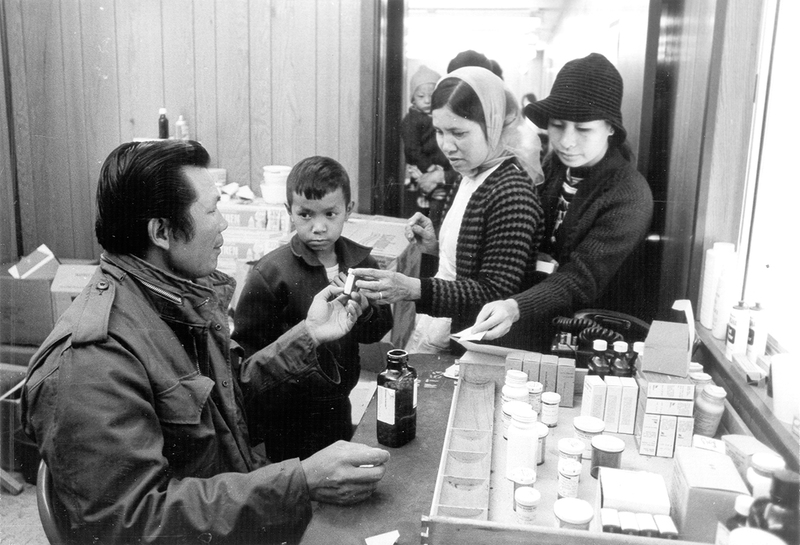 Vietnamese Refugee, Paul Day, formerly a Public Health Specialist in Siagon, lends his assistance to the American Medical staff handling refugees aboard Camp Pendleton by helping to fill prescriptions and pass them out to the refugee patients. 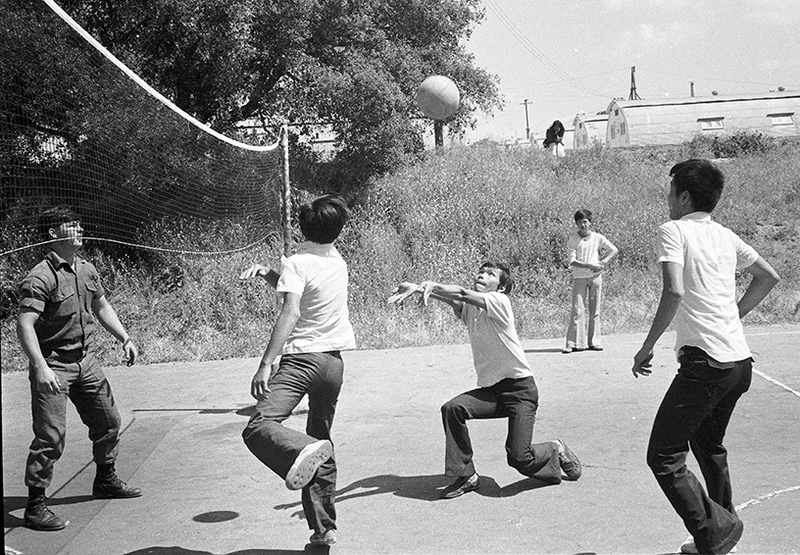 After settling in, many refugees spent their time at the volleyball courts or ping-pong tables set up by Marines. 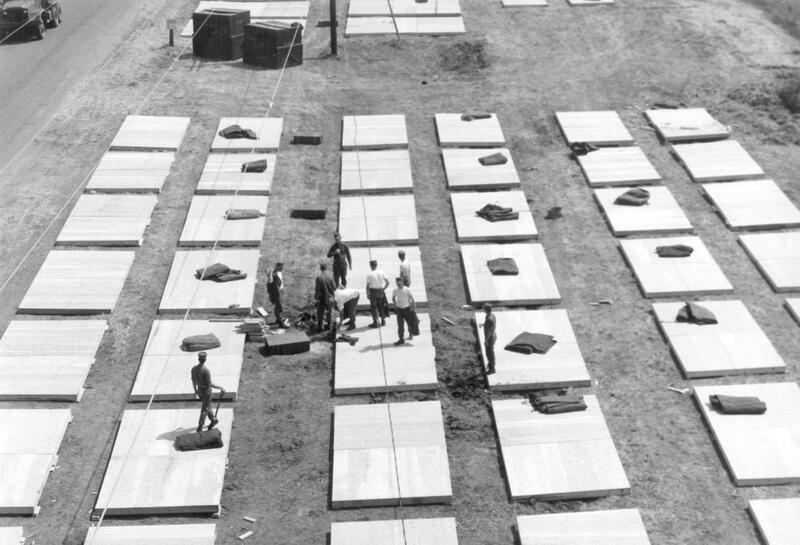 Marines from 7th and 1st Engineer Battalions, First Marine Division, prepare sites for the erecting of tents, as temporary quarters for the Vietnamese refugees, at Camp Cristianitos, Camp Pendleton, CA. 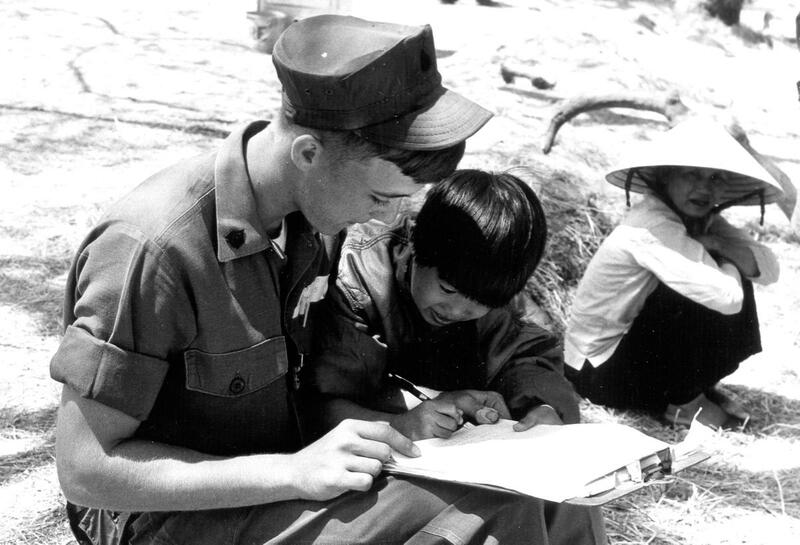 Marine Sergeant J. W. Reed of H&S Company, 3rd AmTrac Battalion helps a young Vietnamese child learn to write English. The child is one of the refugees being processed through Marine Corps Base, Camp Pendleton, California. 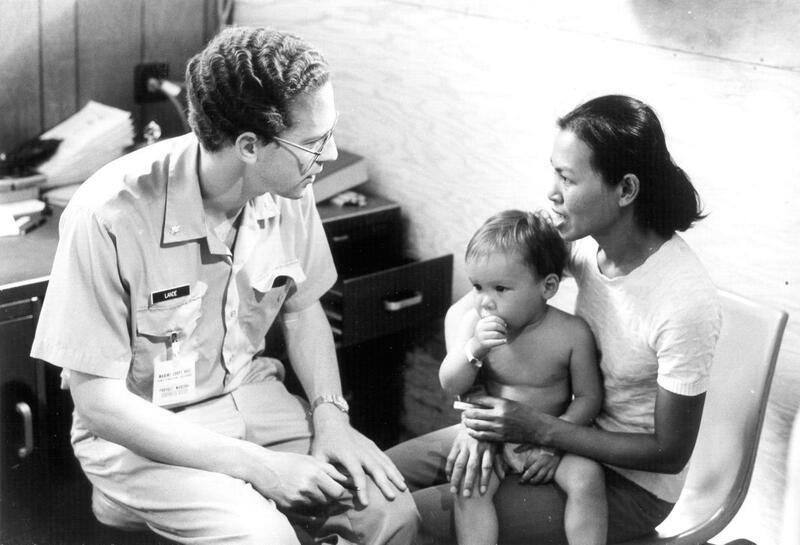 Dr. Lance, of the Naval Regional Medical Center, Camp Pendleton, California, discuss medical subjects with a Vietnamese Refugee as she holds her child on her lap. This occurred during initial processing at Camp Cristianitos, aboard Camp Pendleton Marine Base. 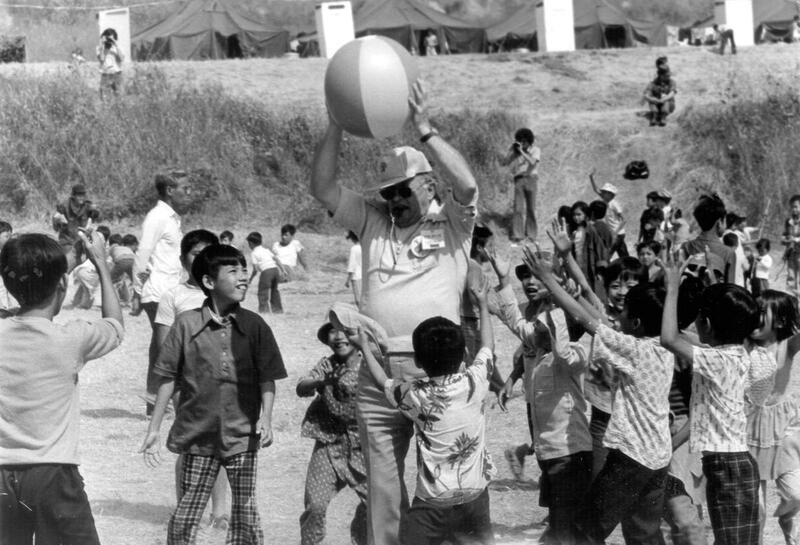 Mr. Jack Harmon, the Director of the Armed Forces YMCA in Oceanside, California, plays a game with a group of young Vietnamese refugees in one of the refugee camps aboard Camp Pendleton. 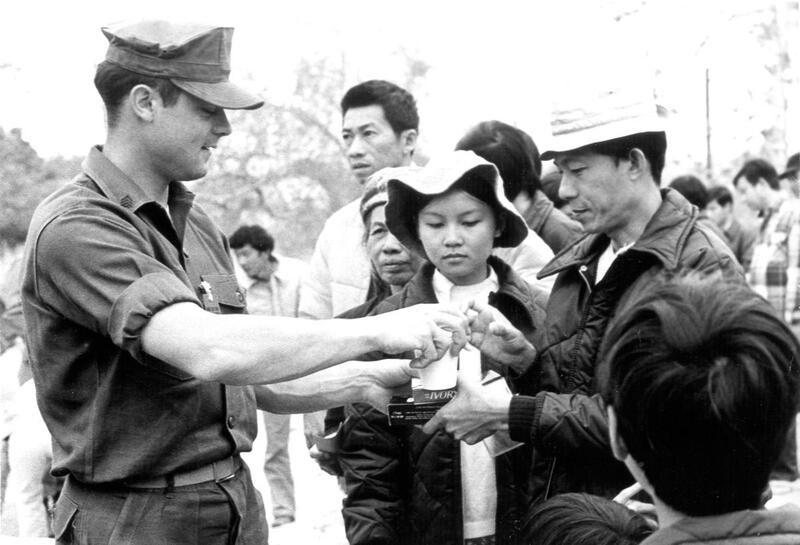 Marine Sgt B. E. Branson, a member of VMO-2, Detachment, Marine Aircraft Group 16, 3rd Marine Aircraft Wing, hands out soap and toothpaste to Vietnamese Refugees in one of the refugee camps aboard Camp Pendleton, California. 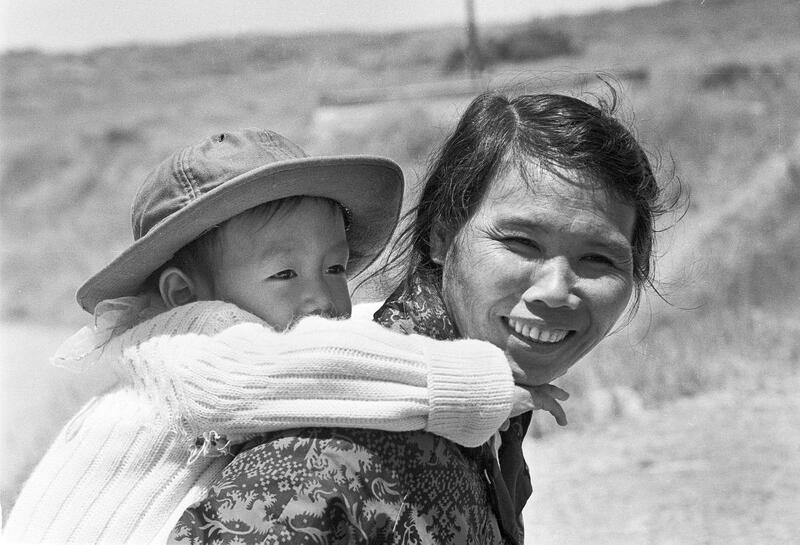 Of the 50,000 Vietnamese refugees at Camp Pendleton, many were children who had to adjust to a new way of life. 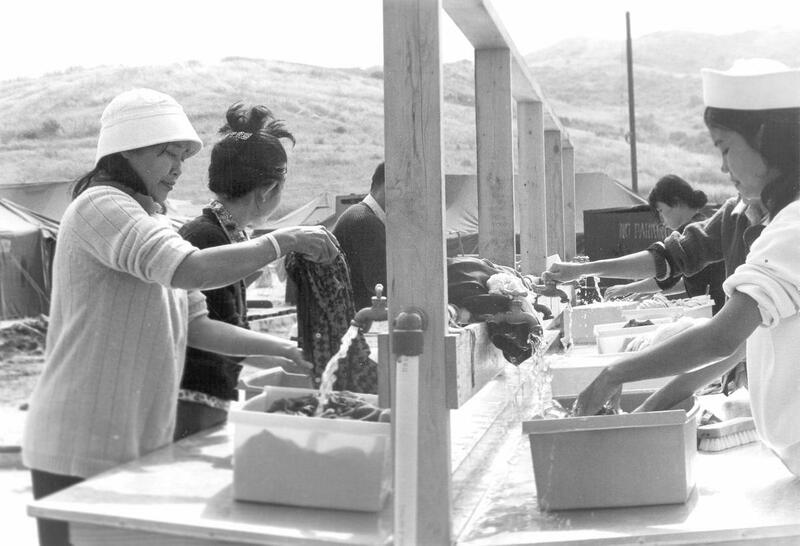 Vietnamese refugees utilize new wash racks recently installed in Camp 6, aboard Camp Pendleton, California. The new wash racks were installed to aid the refugees in their daily washing and have replaced the single faucet type formerly used. Finding people among 50,000 refugees was difficult. 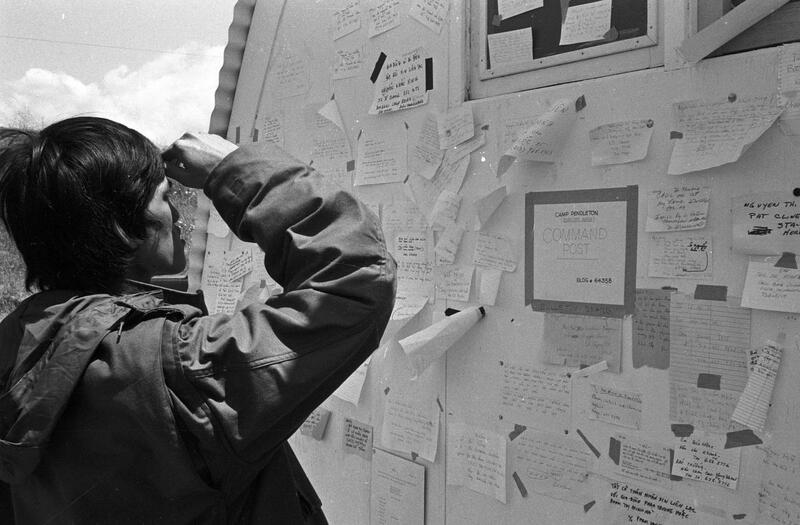 Refugees used command post walls as message boards. 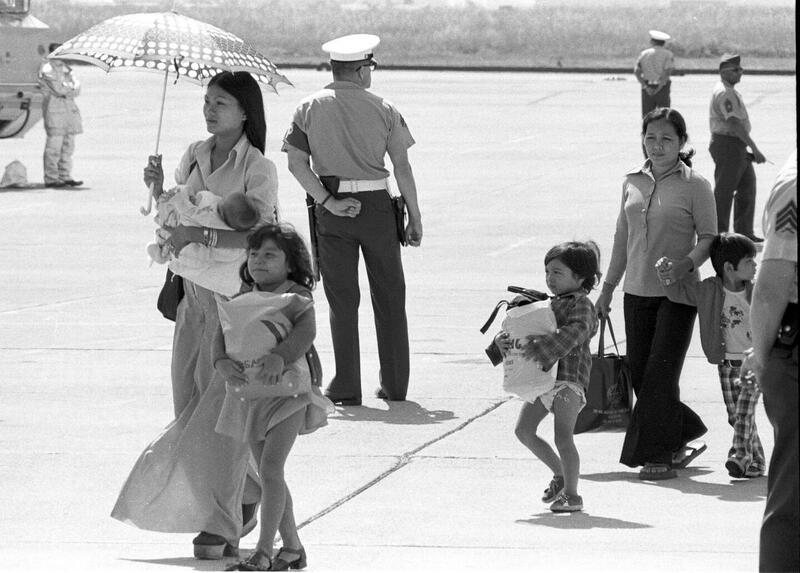 First Vietnamese refugees arrive at El Toro Marine Air Station. Most were American dependents and workers with the U.S.. Mission. 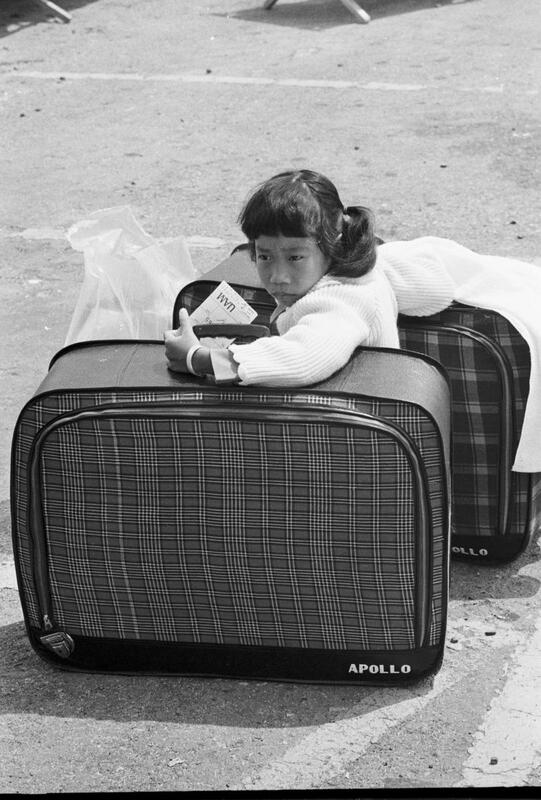 Refugees arriving from Vietnam had little more then a suitcase and the clothes on their backs. In just three days, the Marines installed sewage and communications lines and pitched tents and refurbished Quonset huts for the refugees. Scene at Camp Pendleton presented a mural of confusion, yet out of it all it was people coming out of shock  seeking order out of chaos. 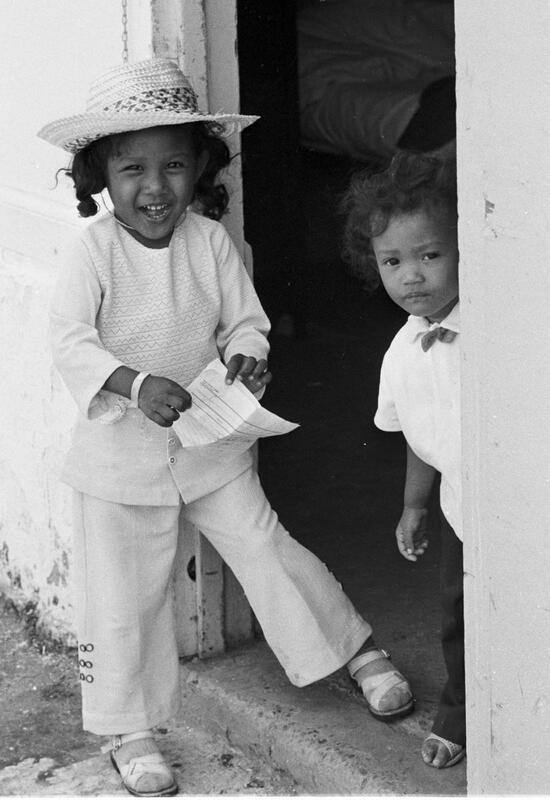 As planes were unloaded and refugees found their luggage, there was the business of being processed, the long lines to wait for official clearance, finding housing in quonset huts or tent, or settling  for the moment  until moving on to permanent locations. It was all a new experience for the two tightly ordered military bases. The human civilian element exploding. 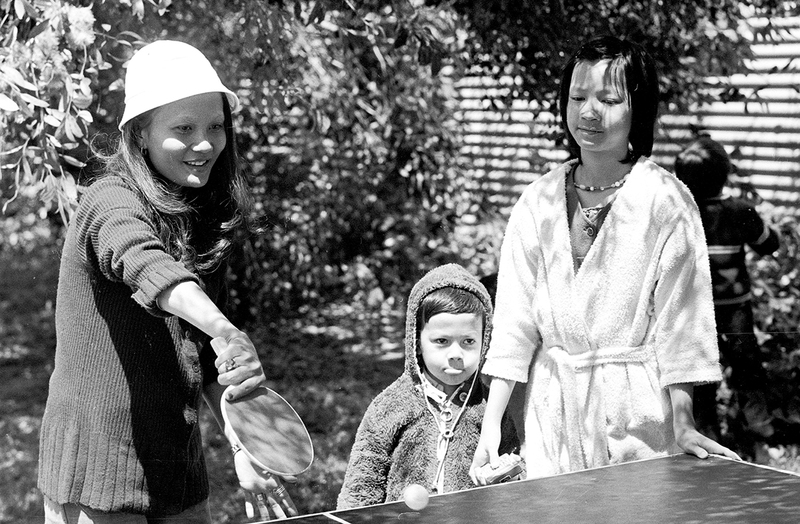 The very young played or slept. Some were still air sick from the long flight. 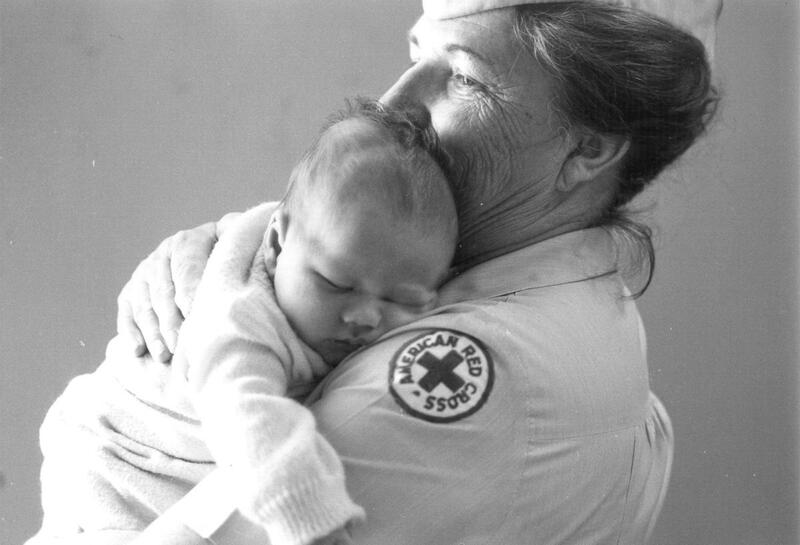 A mother was helped with a newborn child. Some cried. Some laughed. The elderly sat quietly and simply waited  knowing time would quit the waters of confusion and life would go on. 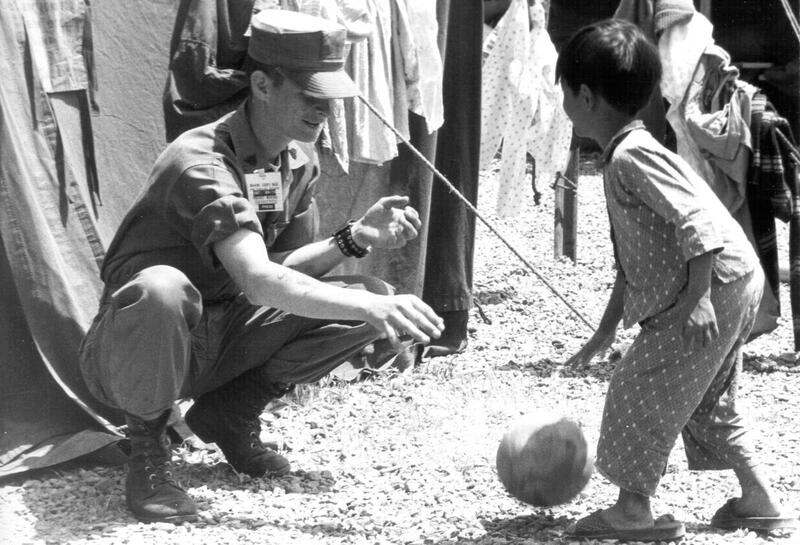 Marine Sergeant G. W. Smith spends his coffee break playing with a Vietnamese child. 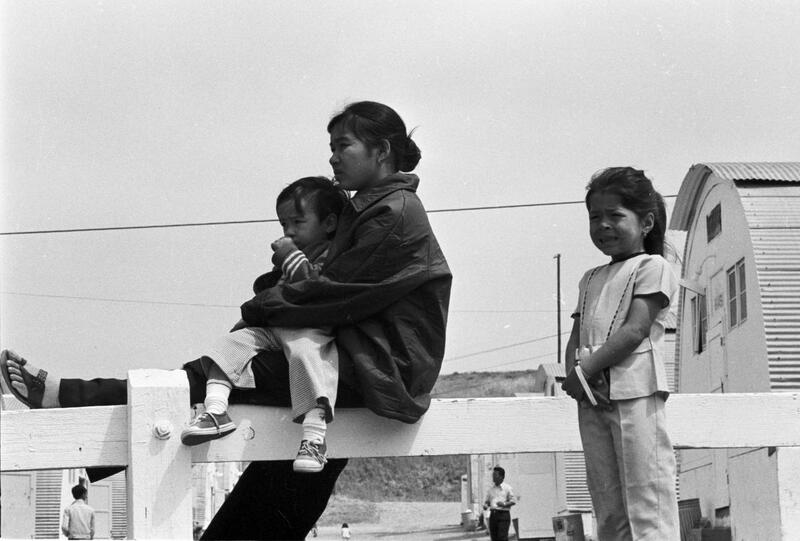 The child is one of many Vietnamese Refugees being processed aboard Camp Pendleton, California. Sgt Smith is a member of 1st Maintenance Battalion, First Force Service Regiment, Camp Pendleton, California. In time, the meal plan was more culturally sensitive. At Camp Pendleton the refugees were safe, but there was still the cold nights, a lack of proper clothing and language barriers — and the lingering emotional trauma of war. 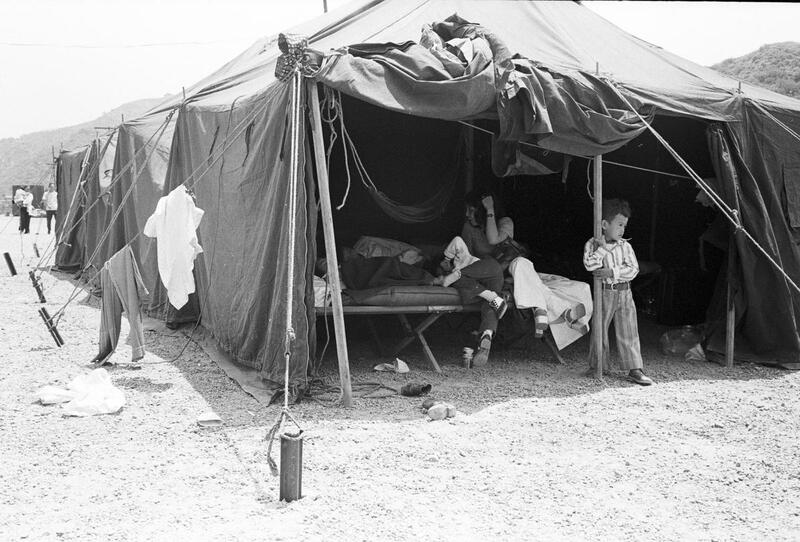 Many refugees were housed in Quonset huts. The Quonset hut got its name from the place where it was first manufactured for the Navy in the early 1940s at Quonset Point, Rhode Island. The standard size is 20 feet by 48 feet. 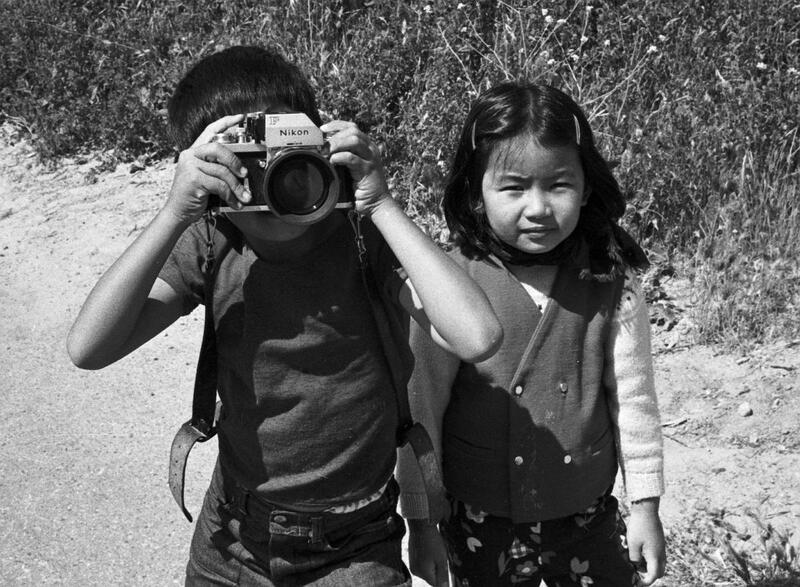 Vietnamese refugees turn the tables on Register photographer Clay Miller as they take his picture. 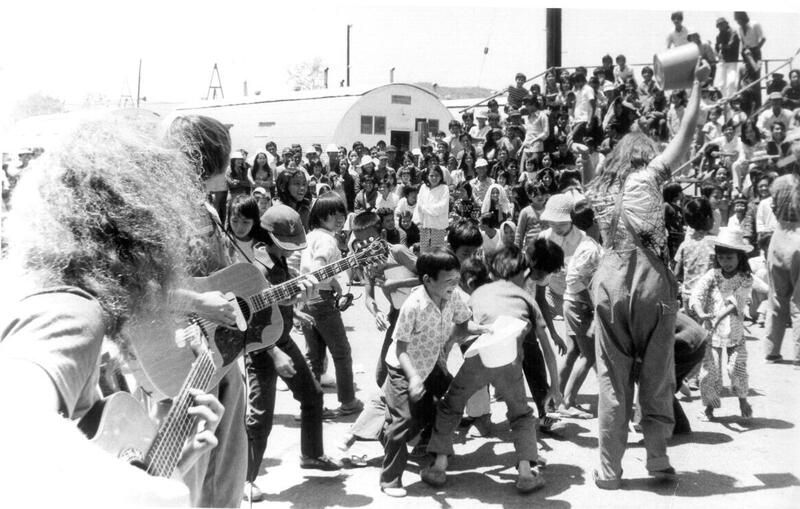 Members of the Chaffey College Children’s Touring Theater created mass excitement and joy as they sang and danced their way into the hearts of the Vietnamese Refugees at Refugees Camps 1, 2, and 3 aboard Camp Pendleton, California. 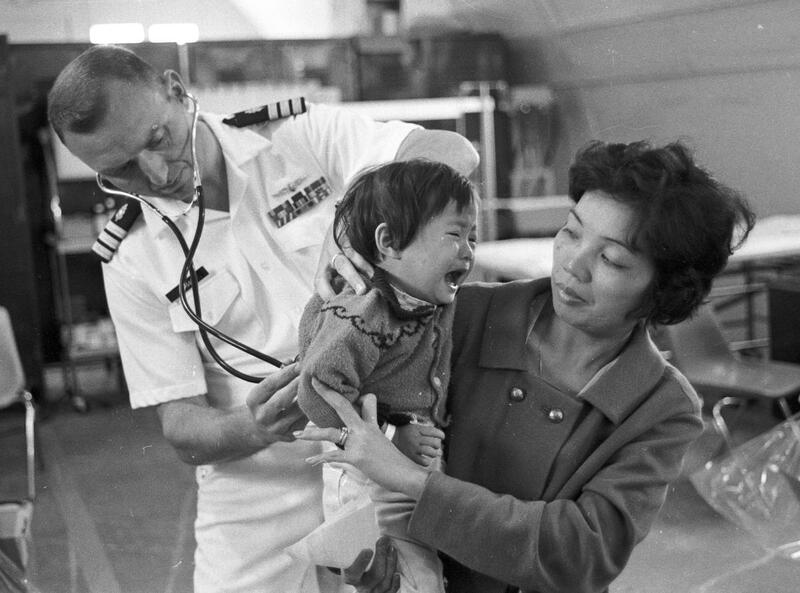 Berenice Warner, Red Cross Hospital Field Director, Navy Regional Medical Center, holds a Vietnamese infant. Setting up the nine tent cities and preparing for an eventual 50,000 refugees to come through was a massive undertaking. 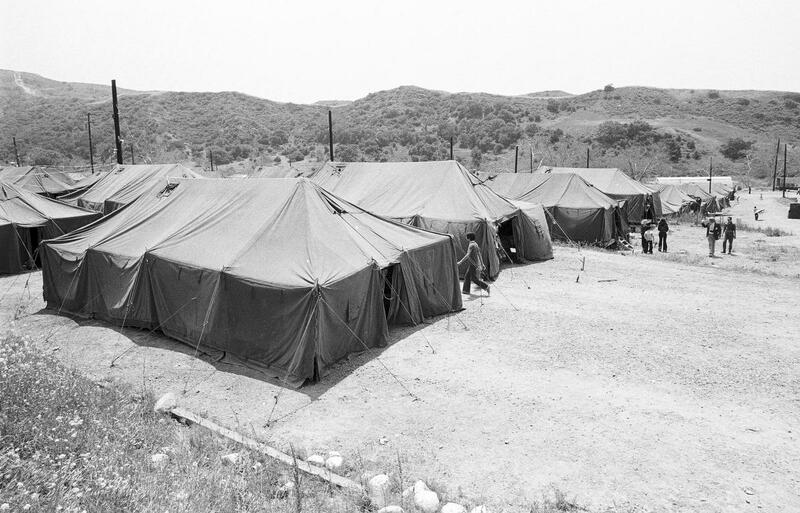 A tent city at Camp Talega built by Marines to house an expected 18-20,000 Vietnamese Refugees. A doctor’s stethoscope can be cold in any language. Navy Cmdr. 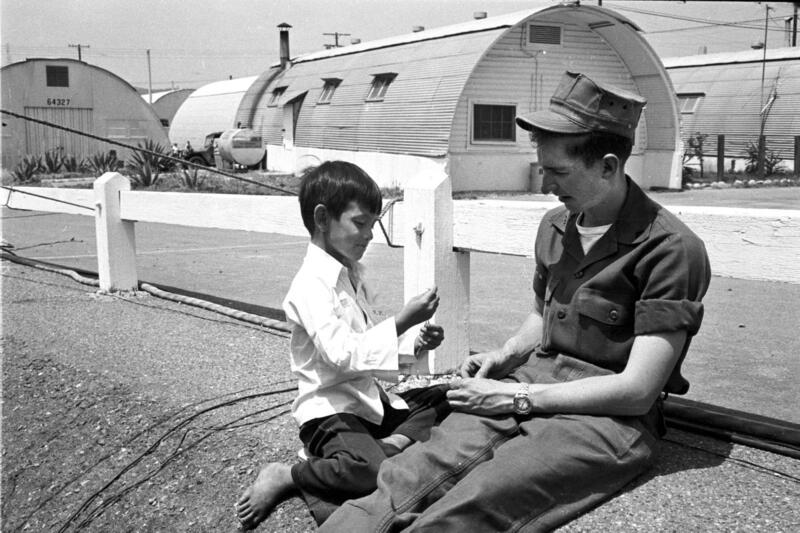 Fred Leisse examines a small Viet refugee at Camp Pendleton. 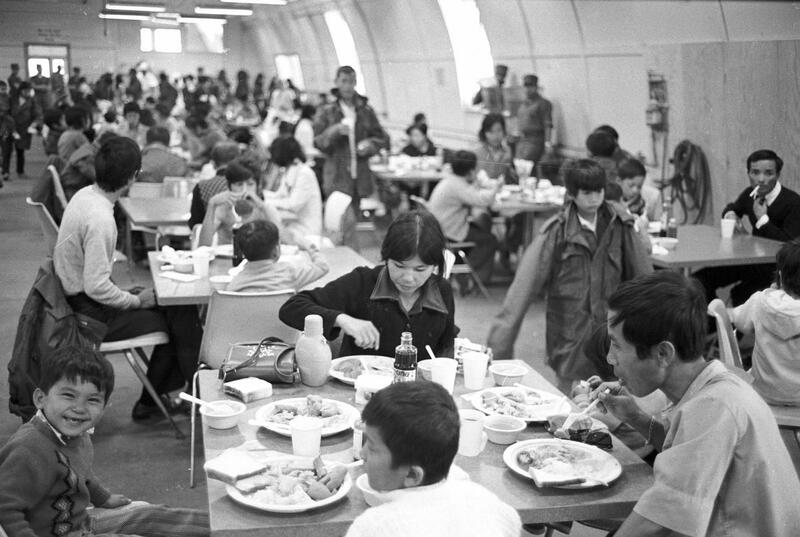 Nearly 900 Marines and civilians worked for six days to erect the 958 tents and 140 Quonset huts that would serve as homes for Vietnamese refugees. 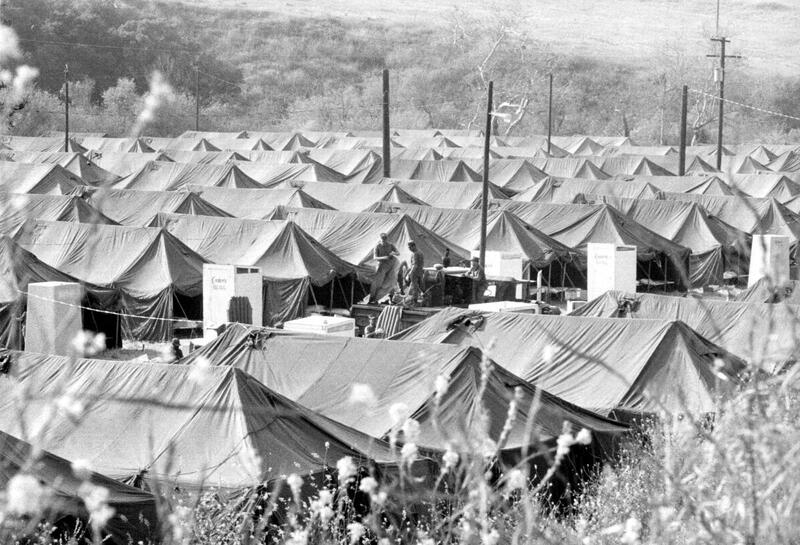 Camp Pendleton was the only tent city in the West; other resettlement sites were built at Fort Chaffee in Arkansas, Eglin Air Force Base in Florida and Fort Indiantown Gap in Pennsylvania. Photo taken on April 30, 1975, by Clay Miller. we came home after Saigon fell and the Vietnamese got 1 % Home loans us GIs had to pay 18% and they got it all given to them.